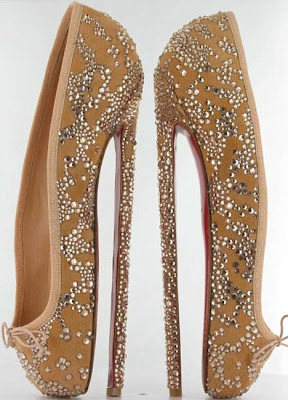 Lush Fab Glam Inspired Lifestyle For The Modern Woman: Christian Louboutin's Eight-Inch Stillettos: Are They Fab or Overkill? Christian Louboutin's Eight-Inch Stillettos: Are They Fab or Overkill? Christian Louboutin has designed a pair of ballet-inspired silk and swarovski crystal stilletto heels, with a height of not three, not four and not six but a whopping eight inches. The heels are being auctioned off today to raise funds for the English National Ballet. Below is a photo of the eight-inch Louboutins and a ballet dancer trying them on. We hope the lucky owner is smart enough to keep these as a collector's item and not actually wear them. Would you wear eight-inch stillettos? Leave a comment below. 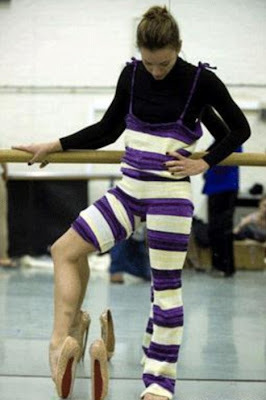 lol the dancer only tried 1 walking in that would end her career. Remove 4 inches and I could wear them! They are gorgeous but ughhh I feel my feet hurting already.